Blessed with spectacular scenery, an enviable location and brimming with charm, Courmayeur is a year round mountain paradise. Tucked in on the Italian side of Mont Blanc, this beautiful mountain town is in the Val d’Aosta, a region known for its warm welcome, gastronomy and agriculture….oh and being ‘the sunny side’. The resort centre is at 1,225m and has a traditional mountain feel with a pretty historical centre framed by the jaw dropping mountains which surround it. There are in fact 14 mountain peaks which soar over 4,000m for you to admire. The town centre is lively and buzzing all through the summer months when the cafes, bars and restaurants spill outside into the lovely Summer sunshine. For the enthusiastic hiker and mountain biker this area is second to none in terms of terrain, challenge and variety. From Courmayeur you can easily link up with many organised walks of varying durations from a day trip to a week long trek. Multi night trips with stopovers in mountain refuges will give you a real sense of mountain life. Some particularly popular walks in the area are the Alta Via No.1 which joins Gressoney Saint Jean with Courmayeur in the foothills of Mont Blanc and Alta Via No.2 which approaches Courmayeur from Champorcher taking in the Gran Paradiso National Park and the Mont Avic Regional Park along the way. However, the most famous of these is probably the Tour du Mont Blanc. Over 100 miles trekking with over 10,000m of altitude gain passing through 3 countries (France, Italy and Switzerland) choosing to camp, glamp or stay in mountain refuges along the way its not for the faint hearted. If you are feeling particularly adventurous, mountain guides offer trips to those wanting to attempt the summit of Mont Blanc itself. For added interest, you could always choose a Fontina Cheese walking tour which takes in the pastures where this delicious local specialty originates. Or why not go walking with donkeys who will keep you company and carry your gear as you stroll through the pretty Valpelline valley. If you prefer your challenges on two wheels, the mountain biking in the area is challenging and well organized. Both the Velo Club of Courmayeur and the Societa Guide Alpine run guided MTB trips with varying levels of difficulty and duration. The Grand Combin, Gran Paradiso and even Mont Blanc can be tackled but a deal of preparation and calves of steel are in order. The closest airport to Courmayeur is Geneva which is 112 km away via the Mont Blanc Tunnel. The transfer time is approximately 90 minutes with private transfers running throughout the year from €235 for up to 8 passengers. Other options include Turin airport which is a shade further away at 150 km. For more information about airport and inter resort transfers take a look at the Peak Transfer Home Page. Eating out in the Aosta Valley is a real treat. There’s a fantastic fusion of traditional Italian cuisine with wood fired pizzas, mouthwatering homemade pasta and succulent meat dishes on the menu in many of the fine restaurants in Courmayeur. You must also sample the local Valdostane flavours; rich, hearty and robust. Polenta, risotto and satisfying soups are stock favorites. But a trip to Courmayeur is simply not complete without sampling two of the protected foods of the region, the tangy local Fontina cheese and the Jambon des Bosses. To round off a meal try a small glass of potent Genepi or Torcetti biscuits, flavoured with honey and dusted with icing sugar. If you are in the centre the Pizzeria du Tunnel is a great bet. Housed in a charming stone building the wood fired pizzas are large and crisp, loyal locals and holidaymakers rate it as some of the best in town. Ristorante La Terrazza is a great choice not least for its varied menu and extensive wine menu. Again the pizzas are very fine but there are also lovely Valdostane dishes for you to try. The well-priced children’s menu is also very welcomed. If you are looking for a place for a fine dining celebration, the Michelin starred Petit Royal Restaurant is intimate and delicious, advanced bookings are a must. To eat up on the mountain there’s also a lot to choose from. Ristorante Chalet Plan Gorret is consistently rated as a favourite, with its mouth-watering selection of local dishes and warm atmosphere, this is a real find and well worth looking out. For more rustic mountain fare, give Maison Vieille a try. Located in a charming shepherd’s hut not just the food but the views are amazing. A final suggestion is the Christiania. Though a little easier on the wallet there is no holding back on the quality of the food which is home prepared at lunch and in the evening. Look out for their speciality pizzas – small, deep fried and oozing with melted local cheese. You might not find crazy dancing on tables nightlife here but instead a rather cool cosmopolitan vibe in the centre of Courmayeur with a varied selection of great cafes and bars where you can relax, unwind and watch the world go by. The Courmaclub in nearby Dolonne is the place to see and be seen later into the night. Celebrity DJs are often in residence and the atmosphere is lively and cosmopolitan. Bar Roma is a more relaxed venue where you can enjoy a glass or two while sinking back into a comfortable sofa. A final recommendation is the fusion destination of the J-Set club. Here sushi meets disco, a real assault on the senses. Wherever you decide to head after a day in this stunningly beautiful area, you can be sure of a warm welcome and a great night out. There is plenty of accommodation to suit all budgets in Courmayeur and the surrounding area. If you are looking to push the boat out, the Grand Hotel Royal e Golf offers you a stylish 5 star option. With a Michelin starred restaurant and a state of the art spa, you can have the most indulgent of stays. Mid market options are plentiful with the Hotel Svizzero, Auberge de la Maison and Hotel Gran Baita being consistently well reviewed. If you prefer to self-cater, Courmayeur has lots of chalets and apartment complexes on offer to suit all group sizes and budgets. HomeAway.com is a good starting point to research these options. You really are spoilt for choice when it comes to finding things to do in the Courmayeur area. The most exciting new attraction is the Skyway Tour. Take this state of the art cable car through three mountain top stations gliding along at 3,500 meters with 360 degrees of the stunning mountains which engulf you. For sports enthusiasts, there are also plenty of options. With the Dora Baltea river roaring through the town, watersports are understandably well catered for. Have a go at canyoning perhaps, launch yourself off high points along the river bank into the waves below, or how about trying rafting or kayaking? Another really popular activity is tackling the Via Ferrata routes. These are carefully constructed climbing routes equipped with ladders, cable bridges and chains to help you across the trickier stretches. A great way to see slightly more inaccessible areas and a solid introduction to mountaineering. If you prefer to keep your feet in the valley, you could always fit in a round of golf or kick back in one of the lovely spas in the area such as the Pré Saint Didier Spa. Entrèves is a short hop from Courmayeur and well worth the trip. It’s a delightful low key place with some charming historical architecture to admire. Aosta is another popular destination where you can soak in the impressively maintained Medieval buildings. Worth a visit too is Dolonne. Just a short stroll from the centre of Courmayeur this charming little village has a maze of back streets to explore and provides a welcome calm after the buzz of its bigger neighbour. If you want to rest any weary legs after a hard day exploring, the world renowned Pré-Saint-Didier Thermal Spa have to be on your itinerary. With waters reaching temperatures of 37 degrees you’ll struggle to drag yourself away. It’s hard to beat for a luxury spa retreat! Obviously the kids can join in the hiking and mountain biking if they’re big enough. But if they are a little more on the smaller side, or would prefer a more localized and relaxing day in Courmayeur this summer there is still plenty to keep them occupied! How about the highest heated swimming pool in Europe for starters? Plan Chécrouit swimming pool sits at a staggering 1,700m above sea level. 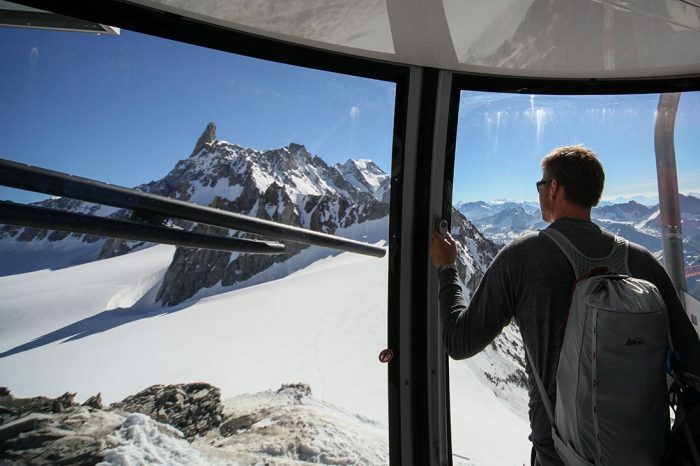 Just take a quick trip in the Dolonne cable car from courmayeur centre to make a splash amongst green alpine pastures and Mont Blanc massif. There are a number of small play parks for the little ones dotted around Courmayeur including the Parco Bollino and the Fun Park in Dolonne. Or why not spend an afternoon in the Sports Centre of a game of tennis or any of the other activities on offer. Peak Transfer are a reputable and reliable transfer company based locally providing a fully insured and licensed transfer service across the French, Italian and Swiss Alps (view our licence). The cost of a private transfer to/from Courmayeur to Geneva Airport is €235 each way for up to 8 passengers in a modern well equipped vehicle. Your personal fluent English driver will pick you up up from the arrivals hall at the airport and drive you directly to your accommodation door without having to wait around for other passengers. All customers will receive an SMS message 24 hrs before your arrival and departure. With no extra costs for luggage (including skis, snowboards and bikes) or baby and child seats. Why not check out some of our independent reviews online here. To book your private transfer simply complete our Quick Quote now.